PULLMAN, Wash. – Industry professionals have named Washington State University one of the 25 best colleges in the world for precision agriculture. At WSU, the Center for Precision and Automated Agricultural Systems (CPAAS) http://cpaas.wsu.edu and the Agricultural Technology and Production Management (AgTM, http://afs.wsu.edu/majors/ag-technology-and-production-management/) academic program are helping to solve one of the biggest challenges facing agriculture today ― labor. Editors of the journal Precision Ag Professional ranked CPAAS and AgTM among the top precision agriculture programs at four-year colleges and universities. The list was based on a survey of program leaders that weighed reputations in education, research and extension. This new ranking aids WSU’s Drive to 25 effort to join the world’s top public research universities. 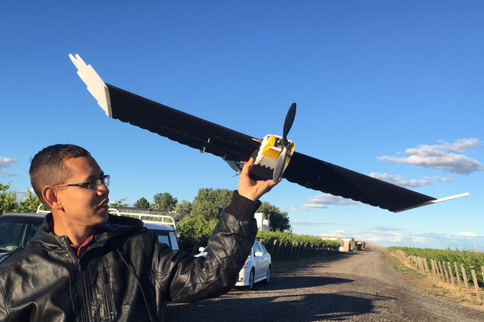 Manoj Karkee, precision agriculture researcher at Washington State University, holds a flying drone designed to deter pest birds from blueberry and wine grape plots. Farm work is hard, seasonal and often short-term, while farm labor is increasingly costly and hard to find. Precision agriculture makes farming more accurate and precise, using new technology to conserve labor and other important resources, like water and fertilizer. “Everything begins with a machine,” said Manoj Karkee, a CPAAS faculty member engineer who develops apple-picking robots and intelligent systems that detect when crops need water. Precision ag, combined with mechanization and automation, is the key to reduce labor use, make field workers safer, and gives farmers the tools to cut use of chemicals, water, and other important resources. “It’s an especially important technology in crop science,” says Karkee. Precision-ag practices let crop scientists and breeders use sensors to understand variability in their crops, skipping the time-consuming process of monitoring and measuring research plots of wheat, for example, by hand. That can cut months off the process of developing hardier and healthier plants, ultimately helping feed a growing planet. Students in WSU’s Ag Tech and Production Management major learn how to mesh precision agriculture, electronics and data skills with crop science, finance and real estate to run the farms of the future.